Elizabeth Goh – A Compendium of Law School, Life, Wellness and her dog named Coco. It’s been well over 6 months since I last wrote here, and I blame the lack of content entirely to the fact that I have been juggling law school, three jobs and volunteering work into a week where I only have 168 hours to do everything. As you may have noticed, Coco and I have moved to http://www.thecompendium.blog! You can now safely assume that the new title of this blog is The Compendium. Well, it just so happened to be that I was already writing upon some very specific, if not niche, topics, and I entirely intend on maintaining my focus upon writing concisely but highly detailed posts about odd little points in time and space. So what are these changes I speak of? Longer historical insights on weekends (probably a Sunday). Yes, I started studying German. Yes, my final exam is tomorrow. No, I am not adequately prepared. So what posts do you have to look forward to? (Sorry Not sorry for all the World War II stuff). Benefits of a social media detox. And my little German ramblings (which will also be in English, don’t worry!) will probably be little posts like these. Also, here’s a bonus photo of Coco, if you’ve been wondering how she’s been. She’s been fit as a fiddle! I was eighteen when I bought my first car. It was a 1996 BMW E36 318i. I had it for three years and had to get towed three times, but I loved it unconditionally to the point where I named ‘him’ Albie. However, after Albie finally died on me for the very last time, he donated his organs for a good cause and I moved onto a slightly newer, younger and sexier car uncreatively named Embie, a Mercedes Benz. You see, I have an affinity for German engineering and though I now drive a ‘Benz’, I’m still a BMW girl at heart. Because of this very expensive and time consuming obsession, when I went to both Stuttgart and Munich in Germany, I made it my prerogative to visit both the Mercedes Benz and BMW Museums. If you’re a reader of my blog, you’ve probably realised that I have a deep interest in modern military history, specifically to do with World War II and the Cold War. Everyone seems to know that Hugo Boss designed the uniforms of the Nazi Party, but other than that, most people have no idea what other brands were implicated. Most of them are right before our very eyes. Want two other brands which collaborated with the National Socialists? You guessed it: BMW (Bayerische Motoren Werke AG) and Mercedes Benz (Daimler AG). Propaganda from Mercedes-Benz during World War II. If you want an idea of other brands worked for the NS dictatorship, here’s just a few for your consideration: Bayer (a subdivision of IG Farben which produced Zyklon B), Siemens (designed and constructed gas chambers), Fanta (designed to replace Coca-Cola as the national soft drink), IBM (their subdivision Deutsche Hollerith Maschinen Gesellschaft/’Dehomag’ designed documentation systems to aid in a more effective administration of the concentration camps and Holocaust), and Volkswagen (the ‘people’s car’ designed to boost employment and the economy). Yup. That’s just to name a few. But if you know anything about National Socialist economics, you’ll understand why these companies worked for the NS dictatorship. This is an over-simplification, but essentially, under Nazism, monopolies were anti-German (see Law for the Protection of the Retail Trade, May 1933. Yes, I am fun at parties.) but if that company were to work with a politically beneficial purpose, they were often encouraged. But in what capacity were BMW and Mercedes Benz involved in World War II? To put it simply, both BMW and Mercedes Benz were involved in the production of motors and engines – aircraft, tanks and submarines, and produced land vehicles such as automobiles and motorbikes. Hitler’s desire was for a mechanised military, however this applied usually to armoured fighting vehicles or personnel transport; by comparison, there was a lack of consideration put into logistical support vehicles, something which would come to haunt them during Operation Barbarossa and the Russian winter. BMW’s origins are centred upon aircraft engines, although their foray into motorcycles prior to the war saw huge technological advancements in that area. BMW’s most famed products during the War were the MW 801 radial engine, the most powerful aircraft engine of the time, produced for the German Luftwaffe. 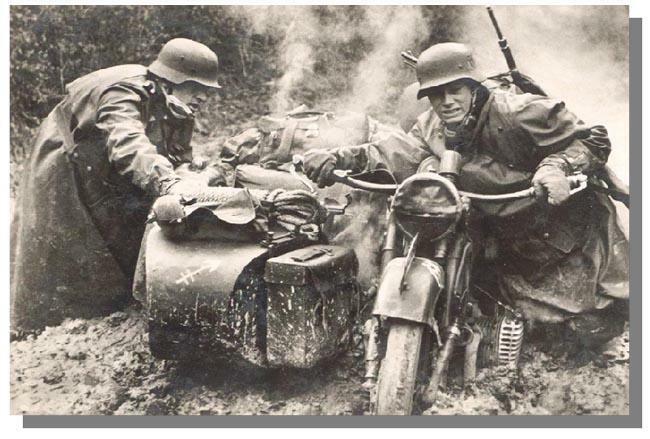 They also produced the highly effective R12 and the R75 motorcycles used by the Wehrmacht, although production of these ceased in 1942 to focus upon aircraft production. Mercedes Benz had an established history into automobiles and motor works prior to the War, but during it, produced the famed Daimler-Benz DB 600 series of aircraft engines. 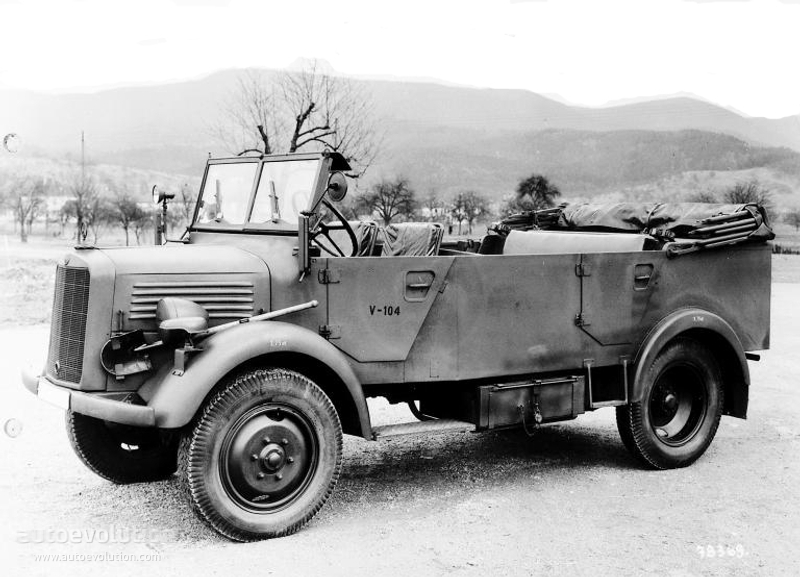 However, their production mainly centres on the production of land vehicles – the Type L3000 A and S UNIMOG supply (Ger: Universalmotorgerät) trucks, the Types L1500 A and S personnel carriers, and most famously, also built Hitler’s favourite vehicle, the Mercedes-Benz 770, as you can see below. But how were these products produced? By using forced or slave labour. A replica of the entrance gate into Dachau Concentration Camp. The original was stolen in 2014. BMW employed approximately 50,000 forced or slave labourers, mostly sourced from Dachau Concentration Camp (Ger: Konzentrationslager Dachau), whilst Daimler AG employed approximately 40,000. To put it into perspective, Bayer employed approximately 80,000 (with IG Farben employing 83,000), whilst by comparison, Hugo Boss employed 140. Forced labourers were absolved of any rights, and were treated inhumanely with very little care taken for their health or safety. They worked 18+ hour days, and were harshly punished for even the smallest issues, and some were executed if they were suspected of sabotage. When a forced labourer was no longer ‘productive’ (ie. they became too weak or sick), they were simply killed, then cremated or buried in mass graves without a name and without any basic human dignity, or their ashes used as fertiliser. Most companies have released some sort of position statement upon the issue of their contribution to the NS state, and some have established compensatory funds, whilst others have been forced into compensation payments by government bodies. Others were ‘surprised’ by the number. Today, most companies recognise the need to commemorate the victims, and ameliorate their relationship with the public following their deeds. But it is one thing to confess one’s misdeeds, and another to actively commemorate the victims. I have come to recognise that there are many ways Germany has healed and progressed from World War II, and that it is unfair to hold the sins of the father to the son. Nonetheless, it is vital that organisations like BMW and Mercedes Benz are not silent on the issue, or do not treat it as an unfortunate time of their company’s history, and it is with a lot of sadness that I say that Mercedes Benz’s efforts are dismal compared to BMW. Both BMW and Mercedes Benz have acknowledged their contributions to the NS regime but have differed dramatically in their presentation of the past. Disclaimer: This section is purely my own opinion. The BMW Headquarter and Museum in Munich, Bavaria. When I visited BMW World (Ger: BMW-Welt), I noticed that they made an outstanding commitment to how they portrayed their contributions to the NS dictatorship. Upon walking into the BMW Museum, you’ll notice that the museum is divided chronologically, and makes explicit reference and display to their actions. In 2005, BMW committed itself to Project Common Remembrance (Ger: Projekt Gemeinsames Erinnern) in which they document the involvement of BMW AG in armaments industry and forced employment under the NS dictatorship, and ultimately published a book upon the topic entitled ‘The War Economy and Forced Labor at BMW’ (Ger: Kriegswirtschaft und Zwangsarbeit bei BMW), which they dedicate a whole gallery to within the Museum, and actively encourage all individuals to observe and read their photobook compilation as they pass through by noting that it is a ‘crucial’ part of their history. The BMW R75, produced predominantly for use by the Wehrmacht. I didn’t manage to get a photo of it, but BMW’s commitment to commemoration and recognition of the victims were included in almost all of the products (mainly engines) and vehicles displayed. This has obviously been done to give the awareness of the situation, and to ensure that those who laboured upon these products were not forgotten. BMW has actively acknowledged its role in utilising forced labourers, and though it maintains that it was like most of the German industrial giants at the time in doing so, it harbours remorse for its actions, and seeks to educate the public about force labour and its role in the National Socialist regime. BMW has since established a recognition and compensation scheme to address all those whom were victims of forced labour during World War II, and actively encourages individuals whom were victims to come forth, tell their story, and receive compensation from BMW from the Compensatory Fund operated through the German Government. The Mercedes-Benz Museum in Stuttgart, Baden-Württemberg. The entire reason why I write this post tonight is because of my disappointment for Mercedes Benz. Don’t get me wrong, the Mercedes Benz Museum is mindblowingly beautiful. But that’s the thing: I believe the designers consciously excluded most of its wartime contributions to maintain the epic tone of the Mercedes Benz journey. There were two central thoughts on this topic which I developed from visiting the Mercedes Benz Museum. The first was that their presentation of the fact was basic and sterile, almost as if it was obligatory and mandatory. The second was that Mercedes Benz was a victim of the NS dictatorship, consistent with one of the many popular perspectives adopted in the aftermath. The language used by Mercedes Benz was fundamental in the development of this perspective. In the presentation of one document in a display (I didn’t manage to get a photo of it), but remember being a little bit incredulous at their statement, ‘Mercedes Benz was forced to accept forced labourers’. The reason for my incredulity is because the decision was not a moral decision; it was a financial decision. Furthermore, you’ll see in the image above the kind of language they used in their deliverance of information relating to certain products. As I wrote previously, the Mercedes-Benz 770 was a vehicle favoured by the Führer, and one which was fundamental in his image. Not only was it a powerful and large vehicle almost 4 metres long, but exuded an image of power which one could even say is consistent with Nazi architecture: monolithic, dominant and utilitarian. And yet, Mercedes Benz chose to truncate their discussion with the mere statement, ‘but also members of the NS regime’. It is this kind of oft-type comment which frequented Mercedes Benz’s discussions, to the point where it was almost forgettable that Mercedes Benz utilised forced labour. That is not to say that they haven’t done something about it: Mercedes Benz has joined BMW in contributing to the Compensatory Fund with the German Government but a Google search of ‘Mercedes Benz and forced labour’ is notoriously sanitary. It is in my frank and honest opinion that the reason for doing this is in maintaining the tone of having a pure and perfect history built upon excellence. With displays like the one below, you can probably see why. History is always interesting, but not always honest. But are BMW and Mercedes Benz required to make their past use of forced labourers a topic of discussion? Forced labour is not a topic merely consigned to history. As of 2016, 21 million men, women and children are still victims of forced labour – the same amount as those who were forced labourers at some point from 1939 to 1945. Approximately 19 million of them are being utilised by private individuals or enterprises. Many of them experience inhumane conditions with long working hours, and have almost no way of absolving themselves of a life of servitude as they earn close to nothing for their labour, and like during the War, thousands still die from the deplorable conditions. The discussion on forced labour is not one that should be relegated to history books and said to be a factor of a bygone era. The discussion needs to be had to make people aware of its continued existence with brands like Disney (yes, Disney! ), Nike, H&M, Marks & Spencer, Wrangler, Lee’s and Old Navy still utilising sweatshops. The issues of forced labour, ethical production, sustainability and labour rights needs to occur. Both BMW and Mercedes Benz owe it to those in servitude to be leaders in this discussion. Building Opening Times: Monday to Saturday from 7.30 am to midnight. Sunday from 9.00 am to midnight. Museum Opening Times: Tuesday to Sunday from 10 am to 6 pm. Public Holidays from 10 am to 6pm. Building Opening Times: Tuesday to Sunday from 9 am to 6 pm. Closed on Monday. Trees line the street and a dog barks somewhere in the distance. A mother and her friend walk slowly down the street pushing a pram whilst her other child plays in a pile of raked leaves upon the front yard of a bland apartment block on Freienwalder Straße. A man farewells a woman standing upon a balcony before getting into a VW and driving away. All is well, all is normal. But it is exactly that which made the visit to Berlin-Hohenschönhausen Memorial even more sinister. As you continue down Freienwalder Straße, you arrive at a collection of abandoned buildings. In the land of the urban explorer’s dream, these buildings are unsuspecting, bar from small signs which indicate that it was part of the site, ‘Special Camp 3’. The signs are scarce, and you pass by a hostel where backpackers smoke upon the veranda, laughing with a beer in their hands. But as soon as you reach the end of the street, the kindness of the quiet urban dream ends and before you stands a prison: Hohenschönhausen. The first thing that you notice about the Berlin-Hohenschönhausen Memorial is how little it represents a traditional memorial: there is no statue or monument to which you’re immediately drawn, and you err at the sight of the large barred gate with only a small man-sized barred entrance where a man who looks like he could lift twice his immense body size smokes on his third cigarette in a row. Behind the monolithic grey-cement wall and the barbed wire coils, you notice a watchtower, its floodlights still in position. The prison as it is today – a prison museum. Following the fall of Nazi Germany, the Hohenschönhausen Prison was opened in 1945 as the Soviet Secret Police took over the area as an internment and transit camp for victims heading towards Sachsenhausen, or further into eastern Europe. Though it was only used for a year, more than 800 deaths were recorded from sickness, disease, malnutrition and dehydration, and in maintenance of the wartime practice, the bodies of the dead were disposed of in bomb craters. In 1951, Hohenschönhausen reopened under the Ministry of State Surveillance – the Stasi – as a remand prison, but was incorporated as what we would now know as a ‘black site’. An overview of the size of the prison complex. In dark grey is the Berlin-Hohenschönhausen Memorial today. In white is the original size of the complex. Officially, the prison did not exist. The complex was in an exclusion zone, which effectively precluded it from state jurisdiction, and there are no known aerial photographs of the complex taken by non-GDR. The Soviet Union became a signatory to the International Covenant on Economic, Social and Cultural Rights in 1966 which altered the way in which the Hohenschönhausen operated, and walking into the prison, this distinct divide is embodied in how the prisoners were treated. Whilst some say that practices prior to 1966 were barbaric in the use of violence towards those at the prison, however post-1966 is characterised entirely my psychological torture. The complex is operated and maintained almost exclusively by those who had previously been interred. As one of the very few English speakers visiting the complex (it is very off the beaten track…), I was taken on a tour by a wonderful guide who took us through the complex chronologically, and if you’ve watched Bridge of Spies or Deutschland 83, you will absolutely recognise some of the areas of the facility. Exterior of the ‘Uboat’ and interrogation complex. The building above houses the most notorious areas of the prison: the ‘Uboat’. The ‘Uboat’ gained its name from its terrifying characteristics: each of the cells was claustrophobically small, and held no windows and lacked adequate ventilation. As one prisoner reflected, she was given the option of a ‘hot cell’ or a ‘cold cell’, and these were in the most literal sense: the hot cell was stationed directly beside the generators of the facility, whilst the cold cells received no heading at all. To add salt to the wound, the temperatures of the hot cells typically remained around 38°C, and with little to no ventilation, that in itself was excruciating. A preserved corridor in the ‘Uboat’. The ‘fridge’ – a disciplinary cell for barely one person. It measured 80×50 cm and was 200cm high. Light bulbs were installed at eye-height in order to disorient the interred. Water cell – a cell with no drainage at the bottom which would be flooded with a maximum of 15cm of water for a long period of time. Fox hole – a prison cell with no lighting inside with a lowered ceiling to prevent full extension of the body. These cells were all since destroyed due to the 1966 International Covenant, but inside, the complex is marked with placards with the testimonies of all those who suffered through them. However, for a most part, a majority of those interred were kept in isolation cells, often for months at a time, and made to adhere to strict rules within the prison whilst they were interrogated for ‘antisocial’ activities. Most of those interred at Hohenschönhausen did not know where they were, let alone what antisocial activities they had performed. The International Covenant on Economic, Social and Cultural Rights imposed stringent minimum requirements on the treatment of prisoners, resulting in a change of practice at Hohenschönhausen. A prisoner’s room after the imposition of the International Covenant. Hohenschönhausen underwent significant changes after the International Covenant was introduced. The imposition of minimum standards in the rights of prisoners brought about alterations to conditions of incarceration and the treatment of prisoners at the complex. However, as with a majority of the Soviet regime, was carefully designed to achieve an outcome. Incarceration from the 70s onwards was designed to take a psychological toll upon the prisoners. The minimum standards of the International Covenant did not address the psychological wellbeing of those interred, and as such, much of the treatment became orchestrated to lead to confessions – false or otherwise. The Uboat fell into disuse, and instead became a storage facility within the complex. The Stasi was created a surveillance state, and kidnapping of both people from the West and East was common. The Barka B100 became notorious not only for its reliability within the GDR, but its frequent usage in the kidnapping of individuals. Members of the Stasi, dressed in common clothing, would often swoop upon individuals upon their way to work, cuffing and blindfolding them inside the van, and keeping them in individual cells created inside of it. Up to five kidnappings could occur, followed by hours of driving to disorient the victims. I didn’t take a photograph of it, but the garage in which they arrived was nothing but blinding white light, designed entirely to maintain the disorientation of the victims once they were produced from the van and hurried down the gaudy brown-wallpapered corridors into the new prison block. Interestingly, and this is probably just me being knit-picky with Bridge of Spies, but this was the corridor used by Spielberg in the film – and had not yet been constructed. The film takes place in 1957, but this block was only built in the 1970s. Yes, I am fun at parties. Conditions were better in the 1970s onwards than they were in the 1950s – hygiene was better, and all prison cells had access to sunlight. The view was sacrificed by slab-glass which prevented those interred from seeing out. We were told of one gentleman who visited the complex, only to recognise that he had been interred at the prison back in the 70s because of the interior, as he had no clue where he had been taken as he had no view of the outside. The prison was also a silent prison, and thus guards communicated with sets of emergency cables down the walls; if there was an emergency, the guard would pull the wire and set breaks joints would set of an alarm in the switchboard room. Thus, if there was an incident, mob mentality would not exacerbate the situation. Throughout the day, prisoners were not allowed to do anything; they were given no materials to read, and were not allowed to exercise, talk, tap, whistle or strafe the room. It was designed to be mind numbing. Interrogations by the Stasi were designed to destabilise the victim. In Deutschland 83, Thomas is interrogated in the above interrogation room, but with the addition of intermittent blinding lights in his face. From what we were told, this wasn’t too far from the reality as lights and sounds were designed entirely to push the boundaries of comfort and distress for all whom were there. Interestingly, each room had two recording devices; one which could be controlled by the interrogator, and another inside a cupboard which was designed not only to catch any admissions not recorded by the interrogator, but to monitor the interrogator for any sympathies he or she might have for the victim – another exemplar example of paranoia and surveillance under the Stasi. Another interesting note, which I didn’t document too well, was the positioning of the chairs. At the table, the victim would sit at the end of the long table, opposite the interrogator, and they would sit upon a stool, whilst four much more comfortable chairs would surround them. The expectation of accompanying visitors often was used against the victim, in saying that someone they knew would be coming to help provide evidence against them, pushing them into an admission. Tremendous credit needs to go towards those who operate and maintain Hohenschönhausen. Those who work there are brave to return again after sometimes long lengths of incarceration with no end in sight. I was fortunate enough to meet two men who had been incarcerated there as mere teens. Frank had been 19 when he had attempted to leap the Wall upon the outskirts of Berlin, and had been interred for 11 months before being sent to prison for another 7 years. Another was the stocky gentleman at the gate. Matthias was 17 when he had the plan to ride his bicycle to the Czech border so that he could escape via Austria. Unable to get the whole way there, he hid in bushes and observed the border patrol for days, observing their timed checks of the border. Calculating the intervals, he dug under the fence only to hit a buried pressure alarm. He was caught and arrested, and sent to Hohenschönhausen. He was apparently a mouthy kid, who, when given a bucket and mop to clean his cell, used the bucket as a pumping weight to do bicep curls. He was harshly disciplined for ‘misappropriating prison property’. Two weeks later, when he was given the bucket and the mop again, he did bicep curls with the other arm. When asked why he did it again during a ‘disciplinary session’, he said that he didn’t want his muscles to be uneven. Hohenschönhausen is a glimpse into the (in)justice system of the Stasi-controlled GDR. Following the fall of the Berlin Wall, Hohenschönhausen was not raided like most government offices in the city, and subsequently, many of the files were destroyed by the Stasi before they could be recovered by the people. However, what has been recovered was shredded, and there is an ongoing project by the Berlin-Hohenschönhausen Memorial association to piece together all that was destroyed. The Stasi’s surveillance state kept a concerning amount of data on each and every individual in the GDR, and many people who were subject to this battle with the decision of whether or not to review their files. Their files reveal a huge amount of information, often revealing why an individual has been incarcerated, and whom was the one to ‘give them up’. For some, it was a ‘friend’ or a colleague. For others, it was family, a husband or wife, a father or child. Though many choose to review the files as a cathartic process of healing, many choose to leave it as a page unturned. English Tour Times: April to October – Daily at 11.30 a.m. and 2.30 p.m; November to March – Daily at 2.30 p.m. Cost: Regular Admission – €6, Concession – €3, Student – €1. Berlin is a beautiful and vibrant place with secrets around every corner. Unfortunately, mere days aren’t enough to explore what secrets it hides. My adoration of Berlin has no end, and I cannot wait to go there again. When most people think of Berlin, people think of World War II. I wrote in my review of Deutschland 83 that the world seems to ignore that between the fall of Nazi Germany and now, that Germany has a history which plagues it to this day: its place in the Cold War. The devisor between the East and West, the divide could not be any more obvious as the streets are marked with bricks to indicate where the Wall of Shame divided the world. But it isn’t just the brickwork which marks where the Wall used to be. One only has to look around them to see the obviousness of this divide. Post-War West Berlin was rebuilt to assume what had been destroyed with classical, neo-classical and bauhaus architecture, and even in 2015, remains very much under construction with empty plots of land in the middle of the city. East Berlin was not so lucky; Soviet architecture’s emphasis upon classlessness and mass production resulted in a lack of uniqueness for monolithic and brutalist housing. None of Stalin’s great architecture seemed to transfer to East Berlin, with government buildings seemingly immersed in amongst residential blocks. It is lucky that the Berlin Wall has not become as touristic as other locations, despite people desperately peddling pieces of painted cement for a few Euros each. The Berlin Wall left behind not only architecture, but victims, and wherever you walk in Berlin, you see remnants of the lives it took. Whether it’s the Stasi Prison, or the crosses by the river, you cannot simply walk past it without knowing what it left behind. Here are some photos of Cold War Berlin! Next posts will be about Hohenschönhausen Stasi Prison (Cold War) and the Centre for German Resistance Movements (WW2). On a cloudy Friday morning in mid-November, I stood under my broken umbrella and stared at the image of the 19-year-old Hans Conrad Schumann leaping over coils of barbed wire. I’m not sure what captivated me to stand there for twenty minutes, glancing between the ground and the large black and white photograph printed upon the side of the building on Bernauer Straße in Berlin. On 13 August 1961, the Berlin Wall ‘officially’ started being built. However, it was the preparations made by the Border Guards of East Berlin/GDR which established the foundations for the next 28 years of construction to what would eventually be known in the media as ‘The Wall of Shame’. After World War II, the four major Allies (the USA, France, Britain and the USSR) forced Germany into demilitarisation as a part of the denazification process of the nation. However, as time went by, it became evident that there was a clear ideological divide between the democratic capitalist nations of the USA, Britain and France and the single-party communist state of the USSR. Despite the insistence of the GDR that no wall was being built, walls no less than three metres high were being constructed to emplace a physical divide between the East and West. Hans Conrad Schumann was an unwitting symbol of freedom in the Cold War, and though he never regretted the decision to defect from the East, it was a decision which forced him into a life of alcoholism and depression. 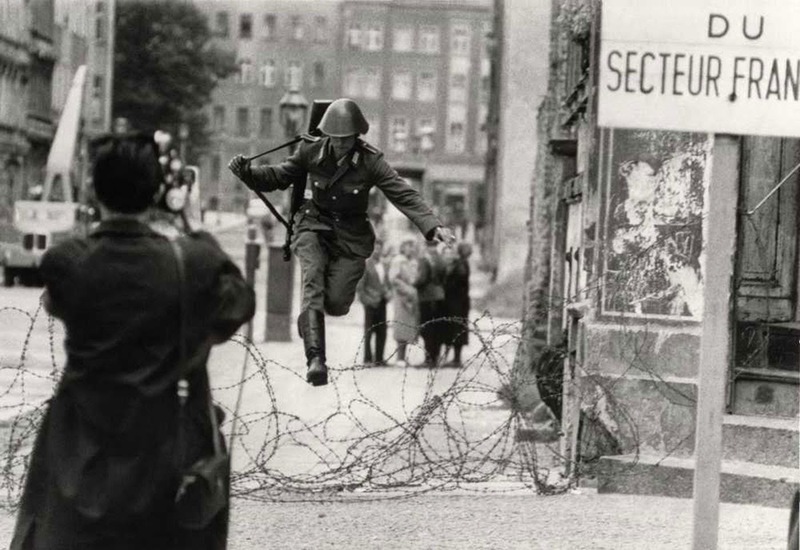 On August 15, 1961, 19-year-old photographer Peter Liebing was tipped off by West German police that something would happen upon Bernauer Straße. He had been tipped off as a 19-year-old Conrad Schumann had stood at what would eventually be the Berlin Wall – coils of barbed wire – and pressed down upon it. In a signal to a West German policeman, he gave a sign – the sign to defect. The situation was dire: as coils of barbed wire were being unrolled, the people of Germany were in uproar, shouting and swearing at police and guards from both side. But upon the Western border, a police van had been stationed opposite the wire, its back door open. When Liebing arrived, he noticed a young GDR border guard leaning against a wall, smoking cigarette after cigarette, trying to keep calm. Two of his comrades were patrolling the other side of the road. To Liebing, it was unclear which of them would defect, and when. As hours went by, nothing happened, but Liebing continued to be at the ready with his Exacta camera ready to capture whatever would occur. But at 4pm, Liebing caught the picture which would change Schumann’s life. A camera crew had forced the view of the camera upon the two other border guards, forcing them to turn around upon their patrol and lose Schumann from sight. In that moment, Schumann tossed away his cigarette, and within seconds, bounded over the barbed wire fence, tossing away his Kalashnikov machine gun and running into the back of the van. Within seconds, Schumann was whisked off to the nearest police station, out of sight. When he arrived, he asked for something to eat, and another cigarette. He then said that the West German police ‘squeezed him like a lemon’. Schumann was the first of many GDR border guards to defect from East Germany. East Germany initially wanted to portray his defection as a kidnapping, but as publicity mounted behind a uniformed member of the GDR fleeing his own regime, it became more and more unviable to maintain the story. In his police report, Schumann provided the West with a valuable insight into the instability behind the East German lines. In the report, Schumann disclosed that in the days prior to his escape, he had worked endlessly in the attempt to maintain control behind East German lines and got very little sleep as GDR troops were reallocated to East Berlin. In the GDR, he had been told certain things about those in West Germany: that those lingering along the Western Berlin border were criminals, or that the West German police did everything to keep the West Berliners in (such as shooting at them). However, as he stood guard at the border, through his observations Schumann came to realise that what he had been told were falsehoods; there were no conflicts between West Berliners and the police and that the ‘Free Zone’ was indeed free. After his escape, Schumann remained in a refugee center in Marienfeld, West Berlin until the end of September 1961. The two other guards, Erich Fierus and Peter Kroger, later stated that had they have caught Schumann in the act, if he had so happened to have gotten caught in the wire, they would have shot him. But with knowledge of what the Stasi were capable of, this would have been one of the kinder options. Conrad Schumann had become a symbol of freedom during the Cold War. But life in the GDR was defined by paranoia. With the State Security – also known as the ‘Stasi’ – keeping an eye on everyone and everything, imprisoning those who were merely suspected of antisocial activities and sentencing all those to prison or hard labour, residents of the GDR had everything to fear. It was well known that there were those in the West whom had been kidnapped by the Stasi, and so it was not irrational to think that even though one was in the West, that they could still be a target. On one side of the Wall, Schumann was a hero. On the other, he was a traitor. In the West, Schumann was alone. Born in Zschochau, Saxony, Nazi Germany in 1942 and trained as a sheepherder, Schumann had left family and friends behind in the East. The West German Government helped him to build a new life in the West. With his ticket to Bavaria, he started work at a Hospital and trained to become a nurse. However, his first decade in the West sees him fall prone to the bottle to numb the pain, the start of what would be a lifelong battle with alcohol addiction. Schumann he met his future wife and with her, had a son, Erwin. He bought his first car, a VW Beetle, in 1963 – a far cry away from the eight year waiting list for a Trabant in the GDR. He took up a new job at a winery, and eventually at the Audi car assembly factory in Ingolstadt. Schumann proudly cheered for FC Bayern München, and attended church on Sundays. He got himself tattoos on both arms along the way. But Schumann had left behind his mother and father, a younger sister. The Stasi, with their eye upon him, record that he wrote exactly every two weeks. 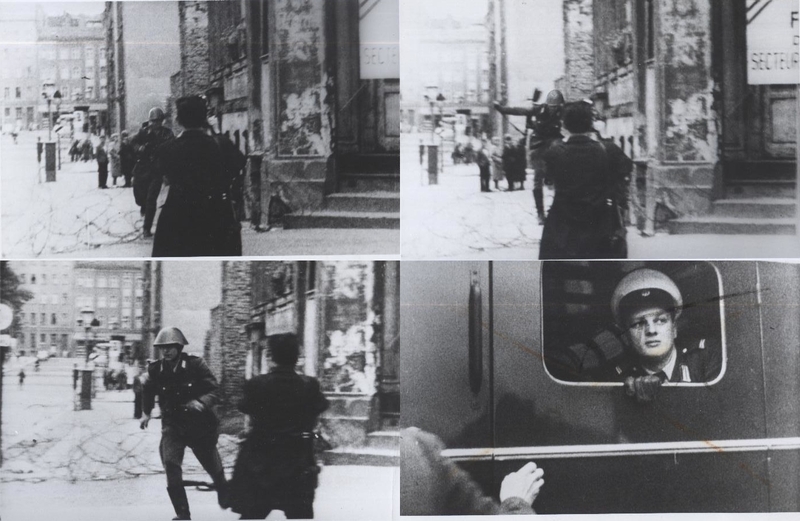 When his father had finally received a permit to see him thirteen years after the jump, Schumann discovered that he had been told by the Stasi that he had read contraband materials, and that they had paid him to jump, to which Schumann had accepted. Over the years, Schumann was tempted to return to Saxony, receiving letters from his family saying that everything would be fine if he were to come home. At one point, he had to be persuaded by a West German policeman against what could have been a disastrous outcome, because little did he know but the letters had been written by family, but dictated by the Stasi. And so despite all pressure from the Stasi, did not return to the GDR. The fear and paranoia plagued his life, and alongside the pressure of his unintentional fame, Schumann led to a lifelong battle with depression and alcoholism. He had remarked, “Only since 9 November 1989 [the date of the fall] have I felt truly free,” and had considered Bavaria where he felt truly at home. Despite the fame, Schumann never blamed Liebing for taking the photograph. Schumann developed a small friendship with Liebing throughout his life as a result of the photograph and met often. Schumann divulged to Liebing in a private talk his reason for defecting: he did not want to be put into the situation where he would have to shoot someone. With one’s upbringing in the GDR being fundamentally driven towards military purpose, it was highly likely that Schumann might eventually have had to. After the Fall of the Berlin Wall, Schumann was reunited with the family he had left behind in East Germany, but it was clear that time had not justified his choice to some. There were those in his family who still regarded him as a traitor, and refused to talk to him. He had frictions with former colleagues, and was hesitant to visit his parents and siblings back in Saxony. Conrad Schumann died in 1998 from suicide, and though he left no note, it was widely accepted that he never escaped living a life in fear. He was 56 years old. Schumann was one of the Berlin Wall’s many victims. Peter Liebing’s photograph of Conrad Schumann, entitled ‘Leap to Freedom’ was compiled as part of UNESCO’s Memory of the World in 2011. Germany in the Cold War seems to be an area which is scarcely addressed in film and television. In the grand scheme of things, it seems to be a very small and irrelevant blip on the radar of the nuclear arms race, especially as the USSR proposes much more glamorous material than modern-day Russia seems to in contemporary cinema. Steven Spielberg’s Bridge of Spies is a study into the minutiae of Cold War negotiations, and through the addition of Spielberg’s magic touch, historical characters and events somehow fall together to create a story ‘Inspired by true events’. 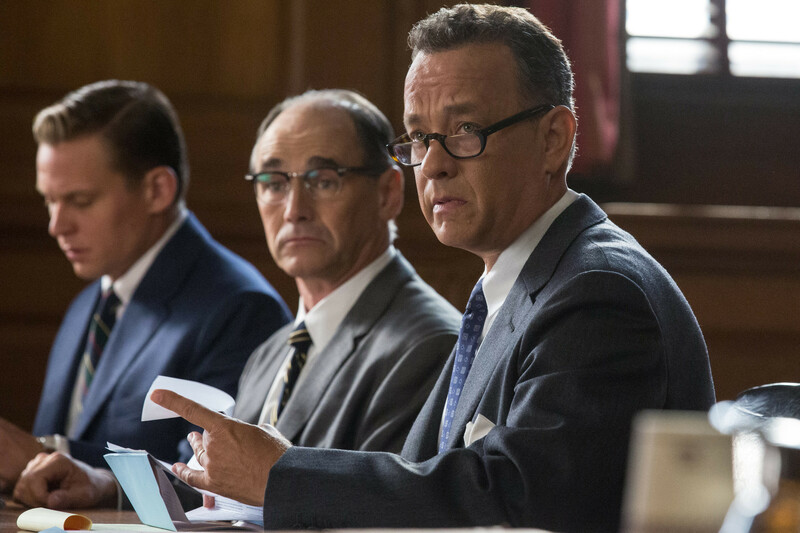 Set in 1957 with the period prior to the construction of the Berlin Wall, Bridge of Spies is a lawyer’s dream. Spielberg is fiercely patriotic, and that American patriotism provides the fundamental foundations of the film. Though many have lost faith in the American Constitution and the legal system, the Bridge of Spies is an optimistic pledge to both: where people fail, the law will always prevail. It is through this optimism Tom Hanks’ Jim Donovan truly comes to life in the negotiation of CIA pilot, Francis Gary Powers (Austin Stowell), and unfortunate Ivy League economics student Frederic Pryor (Will Rogers) for Soviet spy, Rudolf Abel (Mark Rylance). Despite the name, Bridge of Spies is the antithesis of an exciting Hollywood film: it is the Tinker Tailor, Soldier Spy to The Americans. If you were expecting action and grit as the trailers portrayed, you are going to leave the cinema disappointed, but if you are looking at a carefully curated look into the practice of negotiations and mediation, Spielberg makes mediators around the world proud of their job. After all, he makes mediation sound much more hopeful in the invocation of the true American spirit rather than the presentation of technicalities of the law before the Supreme Court. The Hanks-Spielberg Team has produced monumental productions; from Band of Brothers to Catch Me If You Can to The Pacific, these two have dominated cinema for a whole generation, and Bridge of Spies gives the evidence necessary evidence that they will continue to for ages to come. My admiration of Tom Hanks stretches back to the Forrest Gump days, and knowing his immense capability, I can’t help but to feel that Hanks underperformed as James B. Donovan. Donovan was an astute man with the utmost faith in the law. As it was addressed in the film, he was of Nuremberg Trials fame, and went on to successfully negotiate the return of prisoners from the failed Bay of Pigs Invasion. Hanks’ Donovan suffers the honest loss of face of a true American patriot standing by the justice system with integrity; as people turn their backs, the home front suffers, and the conflict drives more than merely professionally. Much of this would not have been achieved without Amy Ryan’s stellar performance as Mary Donovan, and much of Hanks’ portrayal relies upon the perfectly matched on-screen chemistry with Ryan to present an emotionally-charged family crisis. But despite Hanks’ technical prowess, and excellent portrayal as a hard-working lawyer, Hanks’ Donovan appeared to be somewhat two-dimensional with only three emotions – unimpressed, very unimpressed and extremely unimpressed – which can be identified by the increase of wrinkles on his brow. But where you may not be so impressed with Hanks’ performance, you will continue to honour and respect the attention Spielberg places into the presentation of the drama. Bridge of Spies is beautiful to look at, there is no other way to say it. His curation of East and West Berlin in 1957 will take you on a pensive journey. Berlin is bloody and bruised. The desaturation of colour in the portrayal of the frozen German winter forces you to empathise with the world of the German people; suffering defeat in World War II only to be forcefully subjected to a violent ideological divide. Bridge of Spies skilfully addresses the plight of those who attempted to cross the border in the last days before it was closed off. With the 25th anniversary of the Fall of the Berlin Wall, we do not often think about the moments that it was constructed, and the desperation of people to flee with nothing but their most prized possessions but in the film we see it being built by Germans, for Germans, supported by tanks and stoic, war-wearied soldiers. Together with the crude depictions of the flight of those from the East to West through the Death Strip, the honest portrayal of life in Cold War Germany juxtaposed with the safe sanctuary of the classic American neighbourhood is reminiscent of the stark contrasts of a life at war and the home front the Hanks-Spielberg team presented in Episode 10 of The Pacific, and truly forces you to contemplate the world in which we live. The only real casualty of Bridge of Spies is its soundtrack. The use of an almost Gregorian-chant to represent the USSR and the over-usage of American horns to illustrate the greatness of the West is a large disappointment as it employs an archaic stereotype to a refreshing dimension in the portrayal of a different theatre in the Cold War crisis. Thomas Newman of Skyfall and WALL-E fame betrays the subtle finesse that Spielberg works so hard to master. Spielberg’s dramatised portrayal of this event is not merely to honour the legacy left by James B. Donovan upon the world of diplomatic relations. It is a commentary on the USA and its dealing with contemporary terrorism with the imposition of this thought: where is the spirit of the American justice system after 9/11? With a crisis like the Cold War, or the post-9/11 world, should nations abscond their legal obligations? It is this powerful commentary which reminds us all of our need to ensure that the fundamental rights of all are to be maintained even in the times of crisis and that all people are entitled to justice before the law. 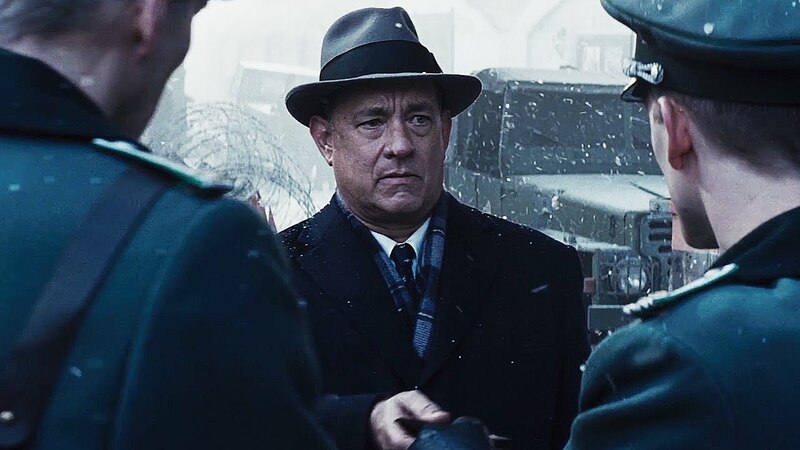 Bridge of Spies is a refreshing look at knife-edge politics without the need for the excitement of the typical Hollywood drama, and is a film carefully curated to redefine the way in which espionage in Cold War can be portrayed.